The cottages are situated within the Charente Maritime region (www.en-charente-maritime.com) which has an abundance of attractions, offering the visitor both picturesque countryside and spectacular coastline. The area boasts over 2,000 hours of sunshine per year, and a micro climate to rival the South of France, due to the influence of the Gulf Stream. 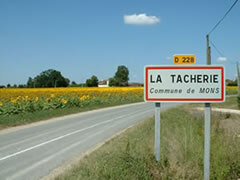 La Tacherie, surrounded by vineyards and fields of sunflowers is just 15 minutes (by car) from the centre of Cognac. Even closer is Matha (5 minutes by car), a typical small French country market town offering a comprehensive range of shops, 3 supermarkets, restaurants and the local bar. 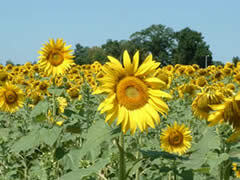 It is extremely well placed to easily explore the Region. The Roman town of Saintes, built in the 1st century and famous for its amphitheatre is just half an hour away , as is Pons, a medieval town, where you can climb the 12th century keep for a breathtaking view of the surrounding valley. 40minutes drive will take you to Angouleme famous for the Circuit des Remparts when the town reverberates to the sound of numerous Bugattis, is a town of architectural and historic interest, ideal for a stroll and lunch in the pedestrian streets within the walls of the upper town. The Atlantic beaches are just one hour away, and stretch from Chatelaillon-Plage with its 2 miles of golden sands (the safest on the Atlantic coast) and brightly coloured villas to La Rochelle where you can visit the Vieux Port guarded by magnificent towers. Here you can linger in a quayside restaurant, or wander through the ancient arcaded shopping centre. Take time to visit Royan one of France’s leading seaside resorts, with its famous golden beaches and sheltered bays, drive along the Cote Sauvage, with it’s powerful breakers, lined with pine trees where you will find the Zoo de la Palmyre, the best zoo in France – it takes 3 hours to cover the 35 acres and see the 1600 species of animals. (www.royan-tourisme.com) Don't forget to take the enormous toll bridge to the Ile de Re and wander through an unspoiled island of sandy beaches, whitewashed houses with brightly coloured shutters, gardens full of holly hocks and take in the atmosphere of the bustling harbours lined with cafes and restaurants. Finally, don’t miss Rochefort beside the Charente river where you can visit La Corderie Royale built in 1666 to make the rigging for the great warships ; the Maritime Museum and the dockyard where the Hermione, La Fayette’s frigate is being reconstructed. Scenic runs will take you to the Dordogne where you can visit picturesque Brantome and its magnificent abbey and Aubeterre-sur-Drone one of the prettiest villages in France, with its steep lanes,tiered houses, and flower decked balconies. Here you can visit one of the most spectacular sites in the Charente –the 12th century church of St Jean with its 66’ underground nave. An hour away by motorway (A10) is the elegant 18th century city of Bordeaux, with it's famous theatres, museums, art galleries and a fantastic array of shops and restaurants (www.bordeaux-tourisme.com). For wine lovers visit the Medoc peninsula where the villages read like a wine list or St Emilion to tastings and tours of the caves. If you wish you can bring your cycles/ or hire them locally, to explore the gently rolling countryside and keen golfers can make use of the championship course just 15 minutes away at Cognac. Scenic runs are available which will take you off the beaten track, through the picturesque countryside to unspoilt villages and naturally there are many fine restaurants in the area where you can sample the local delicacies and vineyards where you can sample the Cognacs, Pineau and wine and buy direct from the grower.